KD comes to Music & Arts Hurst from Grapevine, Texas. 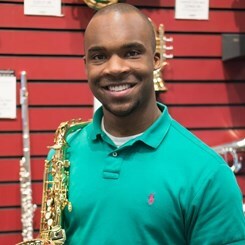 He joined the team in July 2017 and is your go-to man for anything saxophone! He loves jazz, classical, and improv and is currently pursuing a Bachelor of Music Education at the University of Texas at Arlington. With plans to graduate in December 2019, KD hopes to pursue a masters degree in Jazz Performance to further his performance career and also teach on the collegiate level.